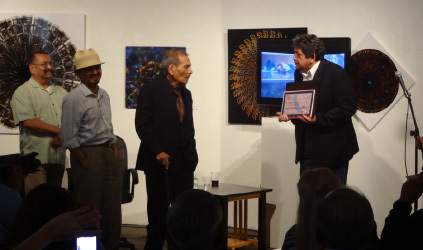 United Artists of Santa Ana (UASA) nominated Emigdio Vasquez, one of the most prolific and famous artists to come out of Orange County, to receive the prestigious “Maestro” award from the Latino Arts Network (LAN), a California association of Latino Museums and Cultural Centers in partnership with the California Arts Council. We are proud to announce that Mr. Vasquez was chosen as the winner of this prestigious award! Mr. Vasquez’ art will be on display for the duration of Saturday’s event and the Maestro himself will be present along with family & friends to celebrate his 74th birthday! Hosting the event will be United Artists of Santa Ana (UASA) and Orange County Center for Contemporary Art (OCCCA) who will exhibit Mr Vasquez’ work March 1-29, 2014. The Caged Chameleon art gallery was an early supporter of Mr. Vasquez' art, exhibiting his work throughout the 80's & 90's Diego's will host an after-party at their location on 3rd & Spurgeon from 4:00 PM to 6:00 pm in honor of Mr. Vasquez' creative legacy. 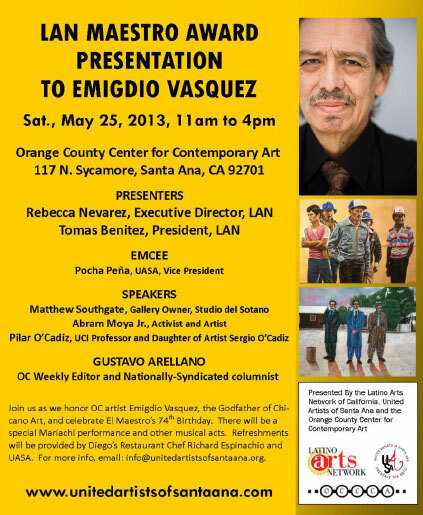 Emigdio Vasquez, one of the most prolific and famous artists to come out of Orange County, has been selected for the prestigious “Maestro” award from the Latino Arts Network (LAN), a California association of Latino Museums and Cultural Centers in partnership with the California Arts Council. United Artists of Santa Ana nominated Mr. Vasquez for this award. The award & reception will take place Saturday, May 25, from 11am-4pm. The event will be hosted by local arts leader United Artists of Santa Ana (UASA) and Orange County Center for Contemporary Art (OCCCA). OCCCA will also feature an exhibition of Mr. Vasquez’s work in March 2014. In depicting multi-cultural mid-century Santa Ana, Emigdio Vasquez excelled in portraying many Orange County landmarks & personalities: Fruit Pickers, Labor Leaders, Zoot Suits, Pachucos, and Nostalgic Neighborhoods & Street Scenes. Mr. Vasquez has created over 400 paintings and 22 murals in Orange County. Additionally, his work hangs in the residence of the US Ambassador to the United Nations stationed in Rome, Italy. Mr. Vasquez’ art will be on display for the duration of Saturday’s event and the maestro himself will be present along with family & friends to celebrate his 74th birthday. Local families, seniors and art lovers are all invited to this free event! Mr. Vasquez was recently honored by Cal State Fullerton and featured in both the OC Weekly & OC Register as a major Orange County artist. Presenting the award will be Latino Arts Network Executive Director, Rebecca Nevarez, and President, Tomas Benitez. Rincón bohemio: Emigdio Vásquez será reconocido en Santa Ana.